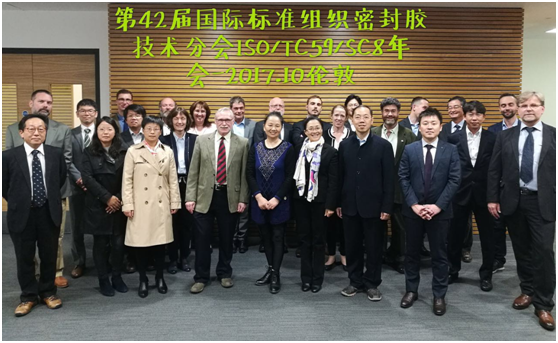 Hangzhou Zhijiang company follow Chinese adhesive Standardization Technical Committee (SAC/TC185) pace, active docking ISO adhesive sealant Technical Committee ISO/TC59/SC8, vice president Dr. Tao was invited to attend annual meeting on preparation of sealant standard which was co-organized by the British Standards Institute BSI Co and held in London, will be widely know sealant for construction and industry development and trend of standard work. ISO international standards organization has many sub technical committees, in which TC59 represents the building and civil engineering, and SC8 is the Standard Technical Committee for sealants in civil engineering. The participating organizations of the National Standards Technical Committee has 11, such as Belgium (NBN), China (SAC), France (AFNOR), Germany (DIN), Japan (JISA), South Korea (KAST), Holland (NEN), Russian Federation, Turkey, Britain, the United States (ANSI (BSI)). 20 observer countries: Belarus Bulgaria, Czech, Egypt, Hungary, Iceland, love Sarnia, India, Iran, Ireland, Israel, Italy, Norway, Poland, Romania, Serbia, Slovenia, South Africa, Spain, switzerland. The participating representatives at this conference are from the national standards organization or secretariat, from professional associations, from testing organizations and key company of industries in the region. Some representatives also work part-time in national associations, such as BASA, JAIA/JSIA, FEICA, Japan adhesives and Sealants Association, etc. During the meeting, delegates and discusses the standard of the working group, and invites Japan, Europe and the United States Association on behalf of mold testing, durability testing, styrofoam, curing, bonding peeling test and other aspects of the technical report. Through this meeting, Zhijiang Company will be more understanding dynamic development of domestic and international standard system, in the future will connect with the international and domestic development standardization of sealant technology, ahead of the layout, compare with the ISO, ASTM, EN, DIN, JIS, GB, JC, JG, HG, QC and other standard sealant national and industry sealant standard, to enhance the international market. Believe Zhijiang Company will make contribution to improve Chinese and international standard sealant technical level in the future.